Shown below, Mr. Thomas conducts a hands on training session with operations personnel as featured in Maintenance Technology. 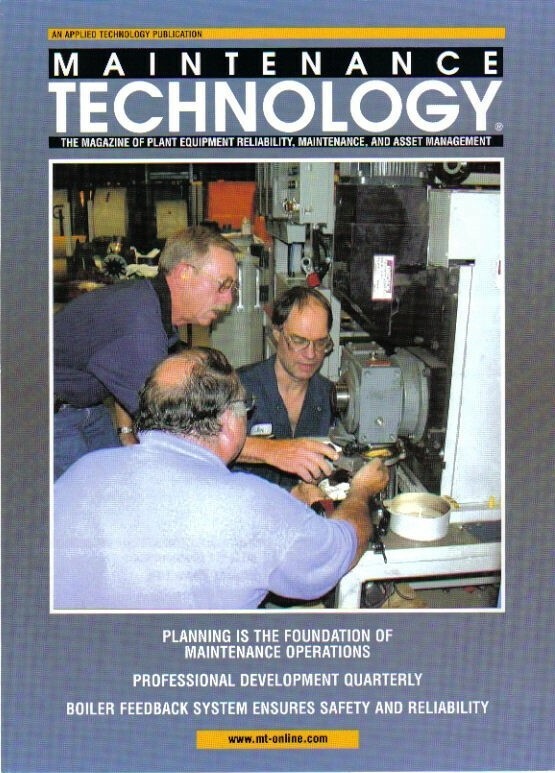 Mr. Thomas began in manufacturing in 1965 working for Ling-Temco-Vought (L.T.V. Aerospace Division) as a fuel systems technician and holds certification as an aircraft electrician. During his employment he attended undergraduate school at East Texas State University completing his Bachelor of Science degree. Upon graduation he entered Navy Pilot Training in Pensacola, Florida and received his officer's commission as a naval pilot in 1969. In 1972 he left the Navy and started his own business in the moving and storage industry. During the next six years the business grew from a small operation to a nationwide business with trucks operating from coast to coast including international operations. In 1978 he obtained his Master's degree education and completed his licensing and teaching certification in all the sciences for secondary education. He taught all the sciences at the high school level for the next two years. From 1980 to 1983, Mr. Thomas was an instructor and Director of Training for Braniff International providing flight engineer training, type-ratings for pilots in all aircraft, emergency training for flight attendants, training for reservation and ticketing agents, and instruction in all skilled trades (airframe and power plant engines) for the Federal Aviation Administration licensing. Mr. Thomas is an F.A.A. licensed airframe and power plant maintenance technician as well as a pilot. He joined Itron, Inc. in 1983 as the Southeastern Regional Sales Manger. Itron, based in Spokane, WA, designs and manufactures microprocessor-based computer systems. Itron grew rapidly from 32 employees to 750 employees two years later, and became #25 on Inc. Magazines' list of the fastest growing privately held companies in the United States. Among his credits are awards for Largest Single Sale in Company History, Highest Number of Sales, Highest Dollar Volume, Salesman of the Year, among other recognitions. In 1991 he joined the staff of Productivity, Inc. providing practical hands on training and implementation to achieve World Class Manufacturing goals. He has provided training and consulting in Total Productive Maintenance (TPM), Achieving Quick Changeover (AQC), Achieving Zero Defects (AZD), Visual Control Systems (VCS), and Autonomous Maintenance (AM) with a vast list of clients. These techniques have become the foundation of all of "Lean Manufacturing" in the industry. Today, as a Managing Partner of Manufacturing Solutions International he continues to work with many of the companies listed providing a practical, "hands-on" training and implementation to achieve World Class Manufacturing. His client list includes ACCO U.S.A., Anchor-Hocking, Allied Signal, A.B.B., Amoco Oil Co., Amoco Chemical, Anheuser Bush, Buckbee-Mears, Caterpillar, Clorox Corp., Cytec-Fiberite, E.I. Dupont (agriculture products, paint, and fiber divisions), Framatome, Ford Motor Company, Ford New Holland, Glaxo-Wellcombe, General Mills/Betty Crocker, General Motors Corp., Giddings & Lewis, Honeywell, Hoechst Celanese, Hill-Rom, I.B.M., Insinkerator, Kraft Foods, Little Tykes, Lydall Corp., Maxwell House Coffee, Miller Brewing, Mobil Oil Corp., Nabisco, Nestles, Risdon, Roadmaster, Rubbermaid, Sandoz-Agro, Shell Oil, Spontex, Saturn Motor Co., Toyota Motor Corp., Toyota Camry Plant, Thomas Built Buses, Weck Industries, Wellmark International, Zoecon, and many others. He presently resides with his family in Chattanooga, TN.